This one covers the creation of sci-fi character artwork. As my other tutorials, this doesn't focus on on particular GIMP "trick", nor does it try to show you how to create one special effect or mood. Rather it tries to show you the whole workflow of creating and planning a more complex image you can put up on the wall or use as a title page for your webcomic or whatever. So if you are looking for quick step-by-step instructions on how to easily reach a cool-looking result, I'm sorry, but this tutorial is not for you. GIMP is a very versatile program, perfectly capable of creating rather high-level artwork. But the more complexity you strive for, the more involved the process is. What I'm aiming for here is to try to give some ideas about what to plan for, and how to handle that in GIMP. ... Obviously, you don't have to create exactly this image (although that is probably the most efficient way to learn). Feel free to make your own futuristic designs (you might want to start with only one character/mecha/robot and use this tutorial as a guide on how to build it up from scratch. You will find that many of these steps are quite generally applicable. Anyway. There are four characters in this image. First of all is the giant mecha in the background, a heavy machine with massive weaponry. Then there is a cyborg soldier (called "Senturo", you'll see that name in the layers, that's why I tell you that), riding on the shoulder of the mecha. In the foreground there is a "think tank" ("Li-six" -- this is the strange looking thing in the lower right). 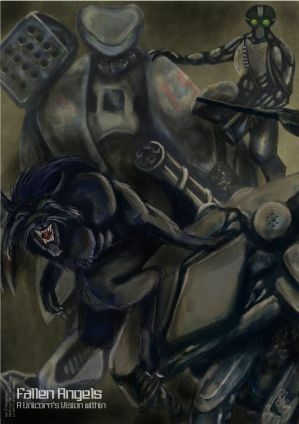 And the weirdest character is a sort of werewolf creature (called "Kat" in the layers structure) that sits on top of the tank, just to make this less of a cliché giant robot picture. All done from scratch on the computer (no scanning), using GIMP under Debian Linux. Throughout this entire picture I only onesingle painting tool, namely the airbrush tool. For 99% of the work the opacity of this tool is set to 50% (lower sometimes). Doing so will allow the airbrush tool to become very versatile, since you can create shadows and shades by just moving the brush over the same area over and over. Armed with this you can get far. The idea is to create an image containing several characters standing at various distances to the "camera". GIMP makes this easy by the existance of Layers. We will use layers quite a bit in this tutorial, so make sure you know how they work. Each character goes into their own layer. This means we will later be able to shift them relative to each other. If we want, we might also easily make alternative images containing just a few of the characters by just hiding the layers we want. Sketching comes first, and now we'll sketch out all the characters in turn. If you scan instead, you can skip the sketching bits. Just remember to draw your characters separately and scan them into separate layers. I'm working on an A4 at 300DPI. All sketching is done with a rather large 60x60 brush. Work at a large zoom-out. Don't be tempted to use a smaller one, you will just be slowed down and will be tempted to work in too many details in your sketches. Leave that for later -- for now we just want to get the basics down! For the mecha I aimed for a stable and rugged appearance. If it's something meant for war it shouldn't be too fancy -- no big ornaments or horns or stuff like that. Note in the following pics how we flip the mecha back and forth (using the flip horisontally tool) to find the best placement. The missile launcher eventually ended up on the right shoulder instead of the left, for example. Don't get so involved with your sketch at this point that you are reluctant to change such details later! To get an idea of the relative size of the mecha to other characters in the picture I sketched the pilot inside it. Ok. So this is how big people should really be by comparison ... Doing something like this really helps your feeling of sizes. Next, the non-humanoid character. This "think tank" (Li-six) (supposedly a tank run by an AI) has a reference sheet I have done earlier, as you can see to the right of this picture. This is a screenshot of my desktop (two monitors wide), where I have my think-tank reference on the right screen and fill in the tank on the left screen. Once again, the tank goes into a separate layer. I reduce opacity of the Mecha layer to to make it easier to draw on the foreground one. (I flipped the mecha too, but eventually I didn't go with that orientation). Next is the cyborg (Senturo). Humanoids in armour like this are very easy to do with the airbrush. Not that we do this a bit differently than we did the mecha and the tank. Since the soldier is supposed to have a more smooth finish, one can essentially sculp them with a large brush and, still using the airbrush, "dress" them with the armour, using shadow to emphasize the 3D-form. Take care to be fast and not dwell on too many details, that'll come during colouring. This is now the layer structure in GIMP (This is why I told you what they are called, so you can recognice the layers). I move the characters around at this point to try to make the composition fit better, but since the image is kinda crowded I decided to also colour on separate layers for each character so I could move them around later too (and maybe only extract certain of the characters if I wanted to). This means that we create four more layers above these, each about to hold the colouring of each of the characters. Time to start colouring. I hide all the other sketch layers and start on the background large mecha. As said I create a new layer for the colouring. Work with the airbrush, filling in the colours and replicate the sketch lines, but in the colour you want. Once I have filled these fields in and made sure each part are visible (the low opacity of the airbrush really helps here! ), we shut off the underlying sketch layer forever. That will not be used again. See why you shouldn't have become too attached to it? For the first time we go down to smaller brushes (still using airbrush tool, remember) to make details on the mecha. We work in some outlines (dark lines) here, but these will disappear when we add light colours later. The goal is to have as few outlines as possible in the end result, in order to increase realism. We also only work with dark shades at this point. It's all done in one layer -- there is no need to get a new one for this. Basic shading complete. The structures of the mecha is visible. But so far this is all shadows. We need light too. But before we can do that we need to establish the global background and the colour scheme of the entire picture -- so we know what colour the light pieces should have. This is the only real "digital trick" used in this picture. We use a "plasma" filter to create random noise and then the colour dialogue to colour that noise in a dusty brown. Since we want the machines to look used and combat ready, A dusty, down-to-earth colours is in order. ... but since we now know the global colour of the piece (dusty brown and ochras), that's what we use for the light areas. Working in light bits in the armour makes wonders for increasing the sense of detail in the mecha. This picture does not have a clear light source, but you should still pick a general direction from which the light comes, so you do highlights on the same side of edges etc. I used the brush tool to put six small dots at the head of the mecha as its "eyes". To make camouflage patterns on the armour I created a separate (short lived) layer and drew jagged patterns with the lasso select tool. Using a very low opacity and a big brush we then use the airbrush to create sharp-edged camo patterns that appears to be a part of the surface. You can repeat the process many times to create overlapping, complex camo structures, maybe with different colours. Since we do the camo on a separate layer we can easily change the opacity of that layer to change how clearly the pattern is shown. Once done we merge the camo layer back into the mecha layer and is done for now. (Using the same camo-tecnique you can also create more distinct patterns, such as the red number I painted on the shoulder of this mecha). I hid the background (and the mecha) so I could see the sketch of the think-tank (Li-six) comes forward Once again, we create a new colour layer for it. We fill that layer in before hiding the now useless sketch layer below. Now that the tank has some colour, we turn on the background colour again so we can start adjusting the colour scale of Li-six to that of the whole image. Note how doing the paining with the airbrush causes the tank to aumatically "shine through" with the background here and there. The tank is almost automatically adjusted to match the colours of the image. We use this to our advantage when we colour. Ochra-coloured light requires ochra-coloured highlights. Thinking of the same things as we did for the mecha (about where the light comes from) we add highlights to bring forth certain parts of the armour. Camoflage paint was done in the same way as for the mecha. The soldier's (Senturo's) turn. New colour layer for him too, we fill him in and hide the sketch layer as before. Having him on a separate layer means we can now move him around to fit perfectly on top of the mecha. Adding of darks, lights and camo complete, all with the airbrush. Camo was done same way as before, but we aim for a different shade to set Senturo apart from the mecha he's hanging on to. Contrasts such as this are important to remember. Onward to Kat. The werewolf was repositioned on the think-tank so it didn't block out the mini-gun in the background. Using a smaller brush we lay down the groundwork for Kat's face. We want it fierce! Here, the back was also made bigger. Black fur is difficult to do since using full black hides all details. The solution is to not make it "fully" black but make the lighting of the image influence the fur-shade heavily. Also adding singlular bright hairs makes the shape of the character come forward. So this is the layer structure at this point. We haven't yet actually deleted the sketch-layers, only hid them. But they are really worthless now, so I did delete the sketches after this step, only retaining the coloured ones. The final picture compositing means lowering the opacity of the mecha and Senturo so that they appear to be further in the backround. Also Li-six is a little faded relative Kat, who is the only one with 100% opacity. A lighter colour always suggests distance -- simply because there is more air between you and the object. I did this by lowering opacity, but you could just as well do it by inserting a "glass plate" layer in front of each character, the plates being filled with flat colour and with varying opacity (see this tutorial for an example of that method). Finishing touches meant adding shadows cast by characters and to touch up on places where they overlapped in the wrong way. The text was the last thing to add, just a simple text string inserted with the proper tool. Total worktime about eight hours. Hope this tutorial was useful to anyone, at least as inspiration on how one could go about things. I would appreciate comments on it.